The 7th annual KC Team Challenge got off to a great start for team West, coming in West 5.5 vs East 3.5 after best-shot doubles. Now we head West to Heritage for Alt-shot doubles at 9 am, followed by Singles. Who will win? The Club Championship is FREE to play for current KCFDC members. Of course, you can join or renew your memebership at the event. You can also sign up for the club at kcfdc.org, Disc Golf World and Dynamic Discs KC. You can check your membership status below. If you need to join or renew your membership click here. If you have questions about your membership, please contact membership@kcfdc.org. 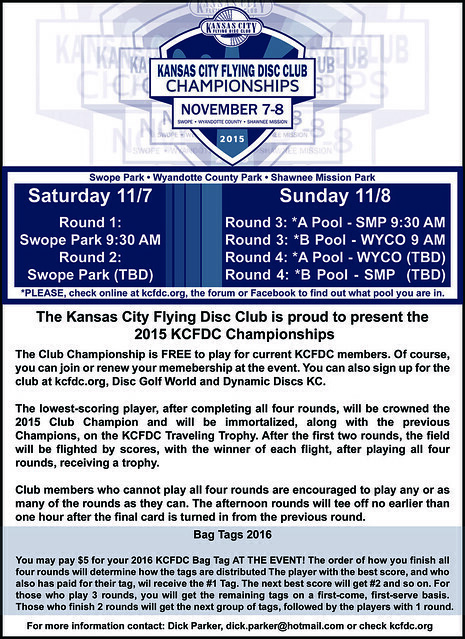 This year, in honor of Swope Park and it's final year as a Kansas City staple for disc golf, we are going to play the "classic" KCFDC courses. We are going to start out at Rosedale Park on Saturday morning, playing both the Up Top course and the Down Under course. On Sunday, we will cross the border to Missouri, where we will play Water Works park, finishing off our weekend with a pseudo Swope gold for what we believe may be the final time. While the course won't be filled with all that gold rope we will make sure to plant our foot on every inch of Swope Park to make sure you as a KCFDC member will get a chance to be a part of history. We will have a small gathering after the final round to say goodbye to Swope as a club for the final time. If you happen to finish your round at Water Works, we hope you make the trip over to Swope to join us. Tee (shotgun) TBA *will allow at least 1 hour from last card turned in for lunch. After the first two rounds, the field will be flighted by scores, with the winner of each flight, after playing all four rounds, receiving a trophy. We will post pool assignments for the second round on kcfdc.org Saturday night. You can also find them at the club Facebook page and on the forum. Club members who cannot play all four rounds are encouraged to play any or as many of the rounds as they can. The afternoon rounds will tee off no earlier than one hour after the final card is turned in from the previous round. Remember, we will attempt to do a final farwell to Swope Park after the final round, so please try to join us for that moment in KC Disc Golf histroy. KCFDC Individual memberships now includes a bag tag, and for new members only, a KCFDC mini disc. Individual Memberships are $25 and Family memberships are now $40 and include two bag tags. The cost of additional tags for family members listed as club members is $5. This means that everyone who renews their membership for the 2018 year will automatically be playing for a bag tag position. If you do not play any rounds then you will be on a first come, first serve. Tags will be available at the Club Elections/Dinner. The final place to pick them up after that is TBD. Happy New Year everyone! I hope everyone has more birdies and less bogies in 2017. Hell, go get an Ace or 10 while you're at it. Ok, so I'm selling my Zuca Cart. It's a 1st Production Run, Lt. Blue Cart with Dark Gray Bag w/ Blue reversible seat cover. It also will come with my fancy Christmas lights. Feel free to PM me with your offer if you are interested. For those of you who do not know what I'm talking about, the PDGA has laid down an 18 month suspension on the #14 player in the world, Brad Williams. I'm just curious what everyone thinks about it. Is it a harsh penalty or do you feel he deserved it? Here is the article that somewhat talks about the suspension. Here is an article written by Loomis about Bradley from 2012. Not everyone knows Mr. Williams and his antics but this will possibly shed some light on the subject. The 2016 Kansas City Wide Open is returning to the PDGA National Tour lineup. Registration will open 1/4/16. Per the PDGA National Tour guidelines, registration will be tiered, beginning with the TOP-rated players and then working its way down until any active PDGA member may register. The KC Wide Open National Tour event includes only the Pro Men (MPO) and Pro Women (FPO) divisions, with a field limit of 72 players. As usual, there will also be a concurrent A-Tier going on with all the aged-based Pro divisions and field limit of 72 players. We are also excited to announce a significant change in this year's KCWO. In lieu of an Amateur event, we are adding a Performance Flight to the mix. The KCWO Performance Flight will be identical to the USDGC Performance Flight that was introduced a few years ago in Rock Hill, South Carolina except that you will not need to qualify for the Wide Open. However, you will need to be a current PDGA member with an established rating. Since using a ratings-based formula is used to calculate projected scores, there is a minimum rating allowed of 875. If you are rated below 875 and want to play, you will have to play the event with an 875 calculated score. If you do not have an established rating, you will have to play the event with a 1000-rated projected score. The Performance side will be a trophy-only event. However, each player will receive an extremely well thought out players' package unlike anything the KCWO has ever offered before. Our hope is that you will leave here feeling that we provided you with an elite tournament experience. Like for the NT, registration will be tiered...except from the bottom up. This will allow players of lower-skill levels the opportunity to sign up first. The Peformance Flight will be limited to 144 players. Look for updated information on our Facebook page and at www.kcwideopen.com. I was cleaning out my car and found a set of keys that someone handed to me during the Club Championships. I personally don't think it was anyone from the event but if anyone knows of someone who lost their keys out there, I may have them. They have a lot of keychain scan cards on it and also a silver pill case. With what looks like "ibuprofen". Anyone, if this is yours let me know and I'll figure out how to get it back to you. I'm on a search to replace my HS drivers. I'm looking for older star bosses, preferably 167g-172g from 2009-2011. Pre #'s work and tourney stamped ones from those years work as well. Let me know if you have any and if you want cash or trade. This event is FREE for all current KCFDC members. If you are not current, you can always sign up at either DDKC, DGW, or the day of the event. Please bring Cash or Check (made out to "KCFDC"). Also having the current form printed off and filled out helps. Are you the best Disc Golfer in Kansas City? This event will somewhat answer that question. All you have to do is be a member and bring your game. Due to how last year seemed to run so smoothly, we will try again to do what we did with the separate pools. The only way to successfully pull this off is to play a course with 2 courses. Well, since Rosedale is the only true 2 course park in the KC area, we have decided to take Swope Park and convert it into 2 courses using the land reserved for Swope Gold and also some safari holes. Then on Sunday we will play at WYCO and Shawnee Mission. This is where it gets tricky. You will need to check here, kcfdc.org, or Facebook to find out where you will need to go to play in the morning. Then we will switch courses in the afternoon. If you are unsure or miss all of our attempts to communicate with you, please get to WYCO early in the morning so you can find out where you are supposed to be. You will have enough time to get to SMP if you are there. I'm staggering the starts just for that purpose. I will do my best to make sure you know. Remember folks, you DO NOT need to play every round. You can come out for 1 round, 2 rounds, 3 rounds or all 4. But if you intend to only play 1 or 2 rounds here an there, please let me or whoever is running your course know. It will make everything go so much easier. Check in for Saturday will be 8:00-9 AM. If you are playing an afternoon round only, please be at the course early to get checked in. Check in for Sunday will be NO LATER than 15 mins before tee time. I will try to post afternoon start times here and on the KCFDC Facebook page. We will also be taking payment for your 2016 Bag Tag. You must PREPAY for the bag tag to be included in the initial distribution of tags. Winning the event will NOT get you an exemption. You must pay to play. They will be distributed at the KCFDC Elections. There are not a lot of people signed up for this but from what I hear about the course there should be. So get signed up. It's a mere hop skip and a jump away. For those of you who do not get on the book of faces, I thought I would share with you the fact that the LDO will not be happening this year. We hope to bring it back next year with renewed enthusiasm and a lot of fun stuff. Thank you everyone for your many of years of attendance. Looking to part with my L-Series Camo Grip bag. If anyone is interested here locally I would rather sell it that way but if not I'll go to the inter-webz. FYI, I don't expect to sell it for cheap as it is sought after by many. Only 110 made, to my knowledge. Please PM me if interested.